I have travelled to many out-of-the-way places but the Antarctic landscape, or my imagined Antarctica, has been on my mind for as long as I can remember. It was like a mythical place that was rumored to be real. I visited Antarctica two years ago in January and feel like a part of me is still there. Before leaving I read several books, but nothing could have prepared me for what I experienced while there. My initial impression was one of suspended belief – I had no point of reference for what I was seeing, making it impossible to take in. The scene from the ship felt like a backdrop for a movie or a play. When I finally kayaked and spent time with the landscape, I began to absorb what I was seeing and close the physical and mental distance I felt at first; I had to touch it to believe it was real. Because Antarctica is so quiet and the color palette limited to mostly grays, blues, and white, I could take in more than usual: limited distractions amplified my perceptions. Time felt suspended and this slowed-down quality allowed for increased sensitivity to my surroundings. Even my ability to listen seemed more acute. Sounds consisted of the ocean, wind, creaking glaciers, penguins, and whales blowing and breaching. Calving glaciers sounded like cannons going off – it was beautiful and terrifying and more alive than any landscape I have visited. The poet John O’Donohue wrote: “the landscape is not just matter but it is as alive as you.” The place has a palpable power that is indescribable. Real Blue, 2017. Pigment print with gouache, graphite, and charcoal. Antarctica is enormous in every way and the idea of “capturing” it with anything, including a camera, seemed ridiculous and not something I was capable of. I shot a lot of footage not knowing what I was going to do with it. After I got back, it took a year before I looked at the images. Instead, I researched and read to try to make sense of my intense response and the trip’s lingering resonance. Maurice Merleau-Ponty’s essay “Eye and Mind” was interesting and helpful. He writes about the world and the body being made of the same “stuff” and the “undividedness” of things. I read about “jouissance” from the perspective of Hélène Cixous and gained further insight from Donna Haraway’s brilliant book Staying with the Trouble: Making Kin in the Chthulucene. These readings and more helped me understand the recalibration that occurred while I was in Antarctica. I realized I have always been uncomfortable with our culture built upon a platform of human exceptionalism. I experienced a place as alive and deserving of respect as any human being. Blue Flow, 2017. Pigment print with ink and graphite. 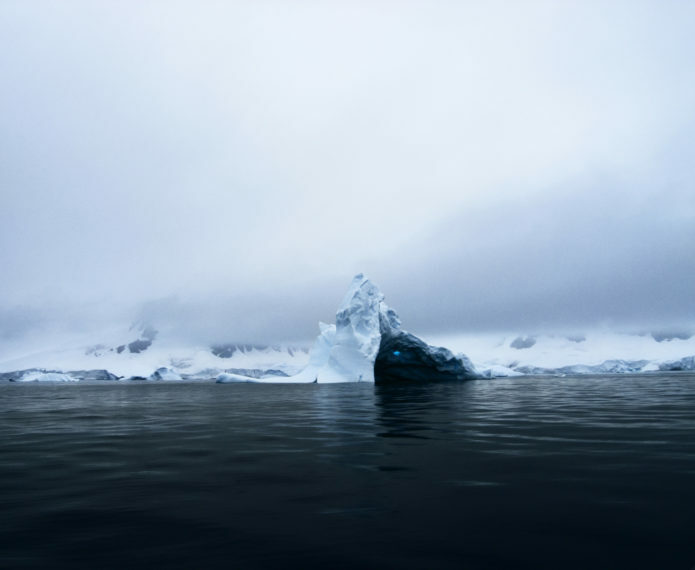 I decided to document the feeling of Antarctica and continue to learn from it in my studio. I traced the architecture of the icebergs and glaciers with graphite and charcoal as a way of remembering the nuances of its form. I emphasized certain remarkable traits such as the impossible neon blue color as well as the millions of variations of blue. While studying my photographic documentation, I tried to mimic Antarctica’s palette and made almost invisible markings on the photographs with ink, charcoal, graphite, and gouache. When printing the final pieces, I played with the density of the photograph only to emphasize certain elements that I remembered but worried were easy to overlook at the reduced scale. I hope the viewer who hasn’t been to Antarctica might experience some of what I experienced. I would love to have the opportunity to take this work outside of art venues to the broader population, and share these observations with as many people as possible. The more the human population embraces the Earth as a companion needing our care, and not as a supply house and a sewer, the better our chances of stopping the destruction. Lone Glow, 2017. Pigment print with charcoal and ink. I’m still working on the Antarctica images in the studio and don’t know when I’ll move on to another body of work. I’ve never worked on a particular series this long but I can’t seem to let go. Since Antarctica is melting and could disappear soon, it’s difficult to stop. The government is working against us and Trump has no interest in accepting climate change or in protecting the environment. I feel committed to Antarctica as both a powerful teacher and a critical place that must survive if we are to maintain a thriving world. Iceberg Study #2, 2017. Pigment print with gouache and graphite. Liza Ryan uses her work in photography, video and mixed media to explore themes such as the presentation and disruption of the visual narrative; the fluid psychological relationship between real and imagined spaces; processes of release, dispersal, and disappearance; and the intimate, undeniable connection between humans and the natural world. Travel and extensive multi-disciplinary research are integral to her practice. Her work has been exhibited both nationally and internationally. She is represented by Kayne Griffin Corcoran Gallery in Los Angeles. Artists and Climate Change is a blog that tracks artistic responses from all disciplines to the problem of climate change. It is both a study about what is being done, and a resource for anyone interested in the subject. Art has the power to reframe the conversation about our environmental crisis so it is inclusive, constructive, and conducive to action. Art can, and should, shape our values and behavior so we are better equipped to face the formidable challenge in front of us.